2009 YZR-M1 (0WS8) - Communication Plaza | Yamaha Motor Co., Ltd. 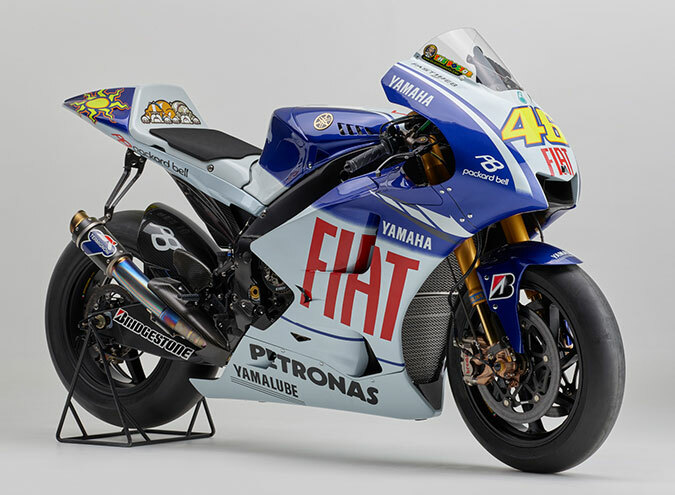 This 800cc MotoGP factory machine was designed with measures to accommodate the new regulations limiting the number of tires and engines for a season. To maximize tire performance, machine dimensions were reviewed and the engine management system functions were improved. Also, the wheelbase was lengthened, the front-rear weight distribution was optimized by changing the rider position and the frame's rigidity balance was revised, thus improving stability in braking and cornering. In the engine, fuel pressure was increased, combustion conditions changed, friction loss was reduced and cooling efficiency increased, etc., to boost power output and torque while also dramatically increasing the mileage that could be expected from each engine.